This month, many of us are talking about Día de los Muertos, or Day of the Dead, with our children and students. This Mexican holiday lends itself to talking about family, food, and of course the rich traditions associated with the Day of the Dead. There are great online activities for the Day of the Dead. Some of my favorites are a new video and virtual “build an altar” websites. I have also included links to crafts and earlier posts with printable materials, a song, and a Learn Spanish with Pictures activity. This Día de los Muertos reading is a fun way of working on language skills. 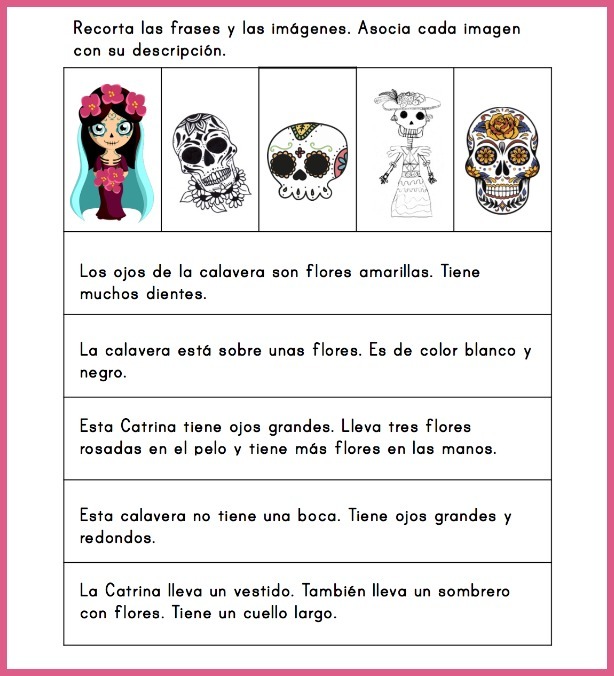 Find the free download and suggestions using the activity in different ways here: Day of the Dead Spanish Reading Activity. This is a lovely video. It is just 3 minutes long, but it incorporates the many elements of the the Day of the Dead celebration and also captures the love and joy associated with the holiday. The Smithsonian Latino Center Día de los Muertos Theater has lots of information in English about the holiday (click the bricks in the wall), a fact sheet, and a glossary. It also has a “build your own altar” that kids will love! You can print the final product. For teachers, there are lesson plans for K-2 and 6-8. Anatomía de un altar is a wonderful site from DallasNews.com with information about the holiday and symbols. Kids can build a virtual altar and print it when they are done. NPR’s Bilingual Short List is a list, in Spanish and English. You are supposed to be guessing what the topic is, but even if you know it is the Day of the Dead, the descriptions are fun to listen to. 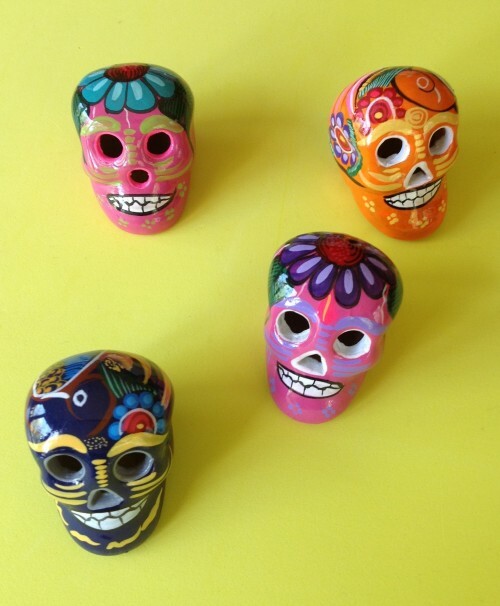 These Day of the Dead crafts are easy enough to do in class with young students. This 3-minute video shows how to make sugar skulls from powdered sugar and sweetened condensed milk. You can find printable coloring pages and treat boxes by following the links in the post. This is a photo of a typical Day of the Dead altar with questions help you to speak Spanish with kids. Los esqueletos is a great song for the Day of the Dead. It also teaches time, counting and lots of common verbs. I’d love to see more lessons that make staying in the target language easy! Would like to enter giveaway for calaveras. Mucus gracias! I love seeing ready made literacy centers for kiddos. I would like reviews of android apps & free videos. Multimedia in Spanish is really helpful. I love Day of the Dead. We made a mini altar last year that I still have displayed. I would love to see more iPad activities. Muchas gracias. I always love to see culturally appropriate crafts! Would love to see more worksheets to use with the preschool set! I love having simple games that will help them learn some of the key vocabulary. Quality bilingual story books are great, too. I love the the activity books and links to games! Would like to enter giveaway for calaveras. Muchas gracias! I would love to see more cultural based activities and resources! I love this site, thanks for making my job easier! Culturally embedded lessons in Spanish…you are awesome! Me gustaria ver apps or libros para Kindle/Ipad o Android/Iphones. I would like to enter the calaveras give away. You are my favorite Spanish resource site. I go when I need an idea and your facebook page gives me ideas I didn’t even know I needed. Thanks for your hard work. Love the hand painted Calaveras. Love your site Muchas Gracias…. I love this site! I know I can always come here and find wonderful resources to use in my classroom. Keep up the great work! ¡Muchísimas gracias! Just found this website thanks to Facebook! I am excited! Muchas gracias ! All the teachers at the spanish department in my school love this site. I will be sharing it in a workshop this week. I would love to see ideas for centers and how to incorporate geography. My students find really difficult to understand the differences between countries and languages. Thanks so much!!! Love it so much, the anatomy of the altar ROCKS!!! I love your site! I teach high school Spanish and really love your describing pictures posts. Would love to see how to incorporate iPad apps in the classroom. I know! I think that is so cool. I wouldn’t have predicted such an effective combination of Día de los Muertos and technology, but it works. I just stumbled upon your site and look forward to exploring it! I would like to find out about iPad apps for my classroom and songs/videos that teach vocabulary or other language concepts. LOVE Día de los Muertos!! I also would love any authentic rhymes, games, etc., to use in my classroom. I would love to see more ideas for listening activities! I would love to see more printable holiday color, number and vocabulary pages. PS I love your site. Thank you for your hard work. So, in other news, I would love to see some different ideas for teaching “classroom objects.” I teach my students how to say paper, pencil, glue, scissors, crayons, etc. so that we can keep basic conversation in the target language during class. I am looking for some interesting ways to teach little guys (especially Kindergarten) these objects without boring them to death! I love Dia de los Muertos and I love to share my culture with my students. I would definitely like simple and quick activities, printables, etc. to do with PreK age children. Thanks! The Dia de los Muertos video is absolutely wonderful – thank you for sharing so much with us. Resources like your site are part of what keeps the inspiration to teach alive. Muchisimas gracias! Me encantan todos los recursos que nos ofrecen aqui en su sitio. Yo quisiera ver mas realia, o sugerencias para incorporar materiales de cultura. Gracias por considerarme! I would love to see more ways to incorporate culture into a packed curriculum. I could spend hours discussing culture, but would love ideas about how to truly integrate it into daily lessons! I love this site! Thank you so much! If I had to choose something, more internet activities. Thank you!! I love seeing ready made literacy centers for Elementary and MS.
Would love to see more ideas for using iPads in the classroom.